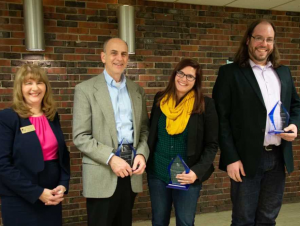 The Communication Department presented Professional Achievement Awards to three local media professionals during its annual awards program on November 16. Honorees included Henry Davis, '79, a journalism graduate who worked as the medical reporter for the Buffalo News for 30 years and previously as a reporter with the Syracuse Newspapers; Devon Jerla, an award-winning public communication graduate who is the marketing manager in the University at Buffalo’s Communication Office and current president of the Public Relations Society of America’s Buffalo Niagara chapter; and Buffalo State Communication Department instructional support technician Brian Milbrand, a multidisciplinary artist whose works incorporate video, film, live performance, audio, and painting. The Professional Achievement Awards, presented biennially, were established in 2008 to recognize the department’s alumni and other local communication practitioners who have achieved a high level of professional success or have made positive contributions to the Communication Department and to the media professions in Western New York. During the event, the department also inducted 21 students into the Rho Psi chapter of the national Communication Honor Society, Lambda Pi Eta.